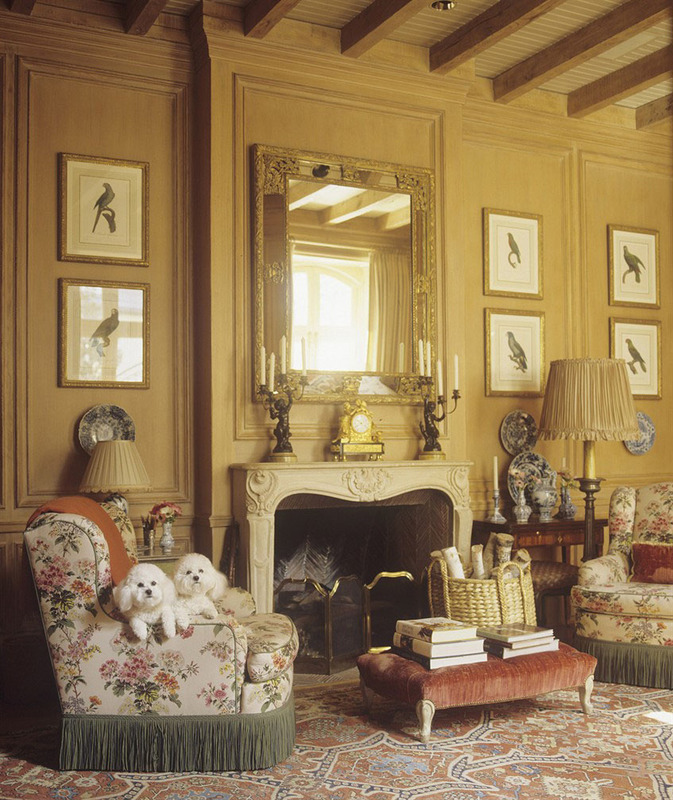 For The Devoted Classicist, the perfect finishing touch to a room is a dog or two, plus maybe a cat. 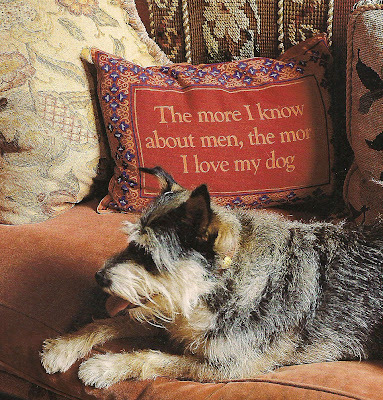 This is not to say that one needs to have a pet as an decorative accessory, of course, but nothing adds more to a room than one's most devoted family member. The image above is the Family Room of clients in Highland Park, Dallas, a delightful couple for which I have had the enviable position of working with several times previous to this renovation. The project was a collaboration with the highly regarded Dallas firm, Josie McCarthy Associates. Bunny and John's dogs in the Kitchen of their Connecticut home. Photo from AN AFFAIR WITH A HOUSE. 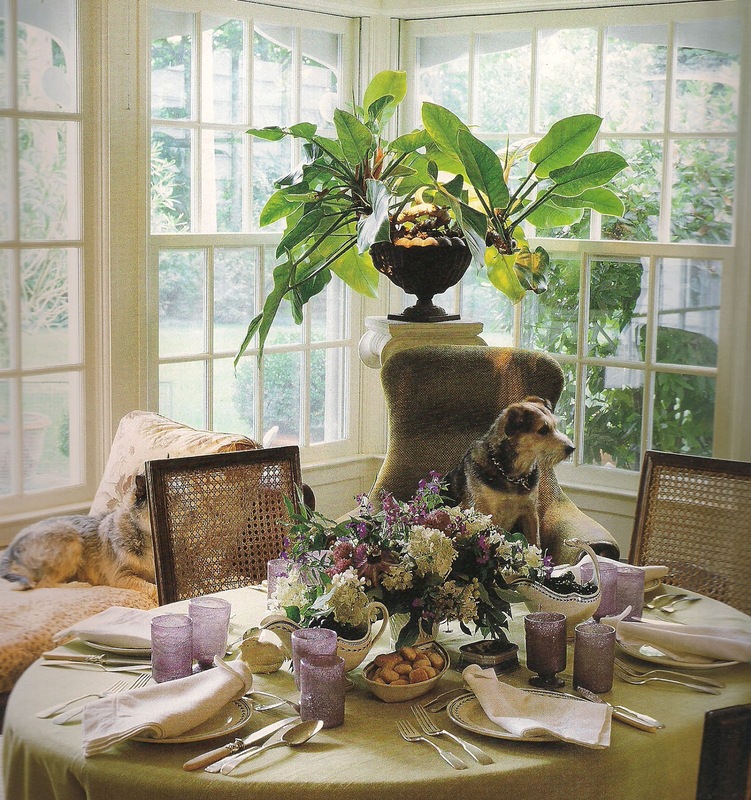 Of course, it is hard to talk about dogs, decoration, and delightful couples without mentioning Bunny Williams and John Rosselli. Bunny's wonderful book, AN AFFAIR WITH A HOUSE, surely the best book of its type, includes a chapter on dogs and interior design. Bunny and John's dog on a sofa in the Barn guesthouse. It can be ordered at a discount, here. (Despite the note to the contrary, it is available on the site if a price is given on the detail sheet, but not with the option of free shipping). 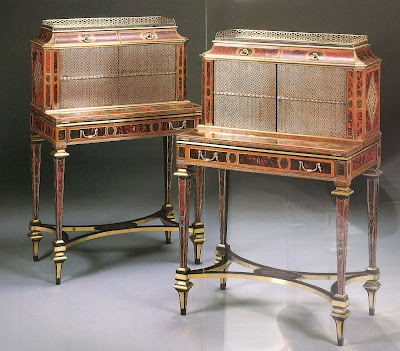 This is the third of a series of posts of The Devoted Classicist on the 18th century folly known as the Menagerie; the first can be seen here and the second, here. This essay reveals the garden and the auxiliary buildings as they appeared in the sales brochure by Estate Agents Jackson-Stops & Staff. Arial view of the Menagerie and gardens. Gervase Jackson-Stops bought the decepit folly in 1973 and planted the three allees in 1984. Vernon Russell-Smith designed the rose garden in 1989. With his partner Ian Kirby, Gervase further developed the gardens in 1992 and the implementation of the master plan continued with subsequent owners. The east garden at the Menagerie. A walled Kitchen Garden was added 2004-5, designed by one of Britain's most highly regarded landscape designers Jinny Blom. 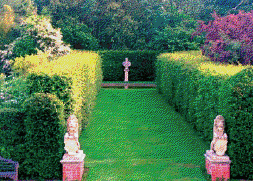 Espaliered fruit trees line the walls that surround the garden filled with boxwood-edged parterres. 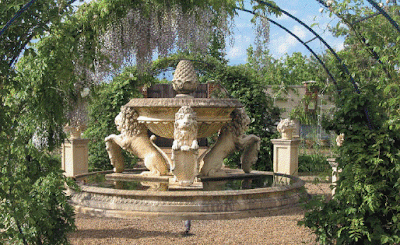 A central fountain in a fish basin is ringed by arched hoops covered in wisteria. The fountain in the Kitchen Garden. 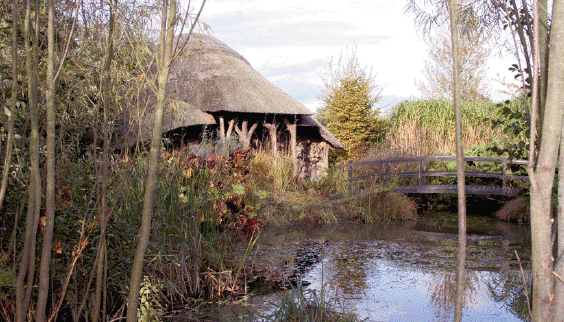 Two of the original ponds were re-dug at the ends of the side allees and each was given an arbour that was later developed into a thatched cottage designed by Charles Morris. One pond is a water garden filled with native plants and the other, exotic. The Gothick Arbour and water garden. The Classical Arbour has Doric columns on one elevation and log columns on another. 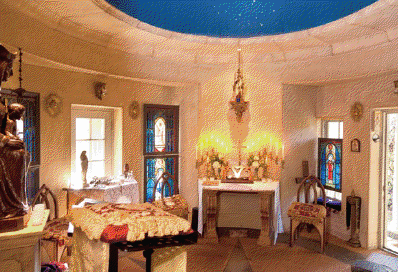 The interior of the main space has a dome and was used as a chapel at the time of the photograph. Also, there are two alcoves, one with a sink. 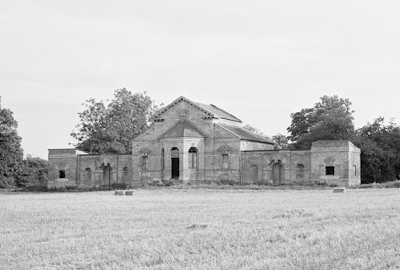 The interior of the Classical Arbour, used as a chapel. 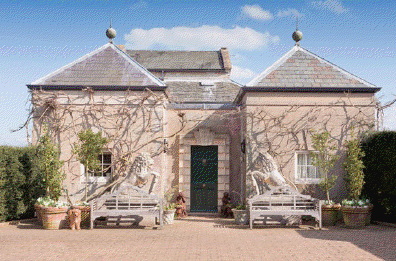 The Gothick Arbour is more formal on one facade and more rustic on the other. There is a built-in bed decorated with fir cones. 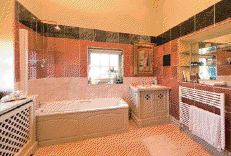 Used as a guest house, there is a lavatory, w.c., shower, and dressing room. 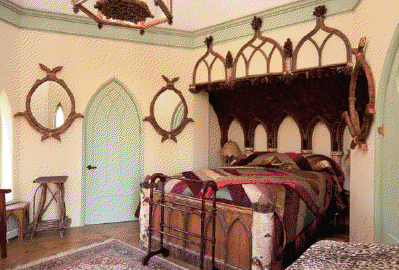 The Gothick Arbour guest house, interior. 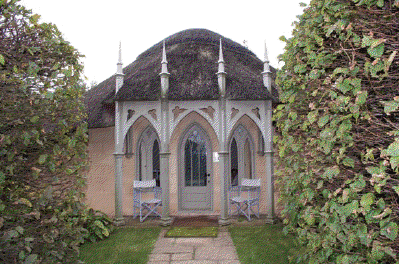 The Gothick Arbour at the Menagerie. Two timber buildings flank the gates to the Nursery Garden; one was used as a Tea Room with serving counter and sink and the other was a Garden Store. There is an aluminum green house and a Garden Office consisting of one large room with a central woodburning stove; one of the two porches has been enclosed to provide a kitchen as well as a w.c and shower. 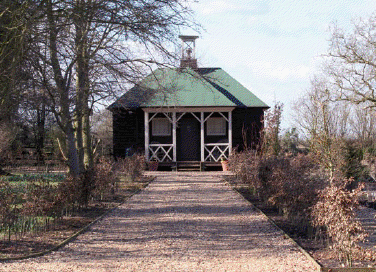 The Garden Office at the Menagerie. A Garage has a Workshop and a Utility Room with a central heating boiler, deep Belfast sink, and plumbing for a washer and dryer. All the photos are from the Jackson-Stops & Staff sales brochure that was thoughtfully provided by devoted reader Tom Barton of Dixie Graphics architectural signage. 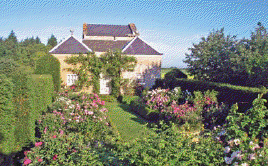 Today some feel inclined to put a minimum size on properties to qualify as an "estate". This is a good example of planning on only four acres. 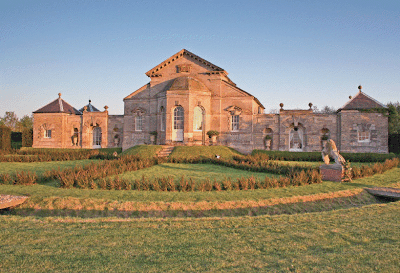 Devoted Readers will recall a recent essay about the home of my late friend Gervase Jackson-Stops, a delightful 18th century folly at Horton Park, Northamptonshire, England. 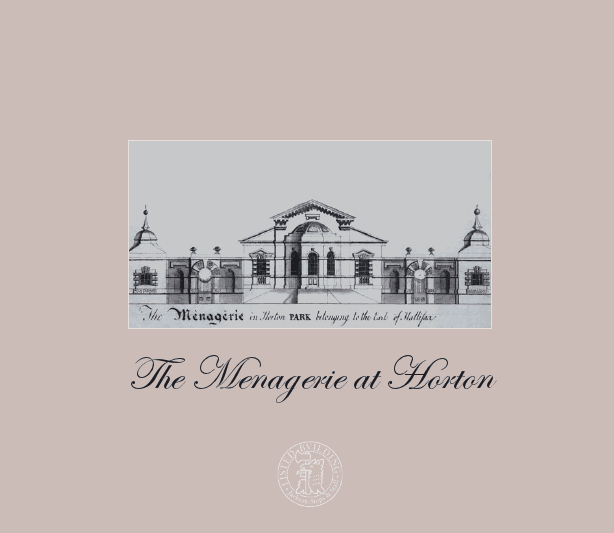 The Grade II listed building was an eye-catcher from the main house and named the Menagerie because of its location adjacent to a private zoo of Lord Halifax. The Devoted Classicist post dated February 27, 2012, shows the folly as it appeared during the ownership of Mr. Jackson-Stops. The principal elevation of The Menagerie. Thankfully, Toby Worthington submitted additional photos from Gervase's occupancy soon after the essay was published and those were incorporated into that first post. 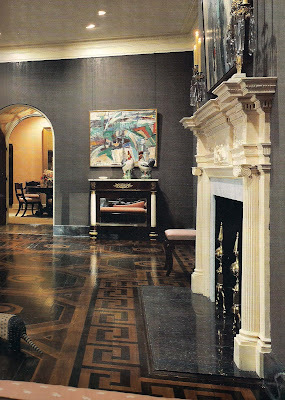 in a 1971 issue of Country Life magazine. Then good fortune shined again as a whole cache of photos -- and floor plans -- were provided by Tom Barton of Dixie Graphics in Nashville (a good source for architectural signage, plaques and recognition awards). 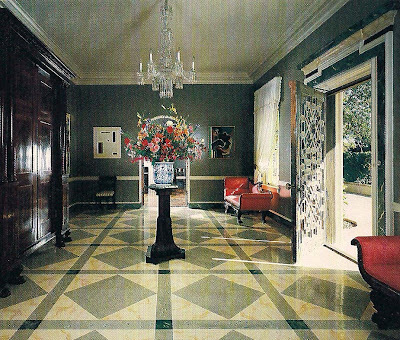 Although these images date from the sales brochure showing alterations by a subsequent owner, more of the story of this very special residence is revealed. 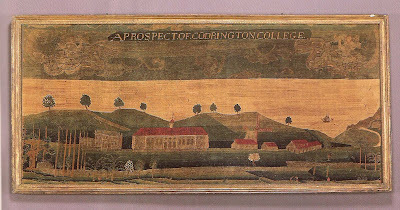 showing a plowed agricultural field to the north. 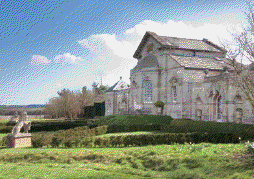 In its present incarnation, the folly is treated as the great house of an estate. 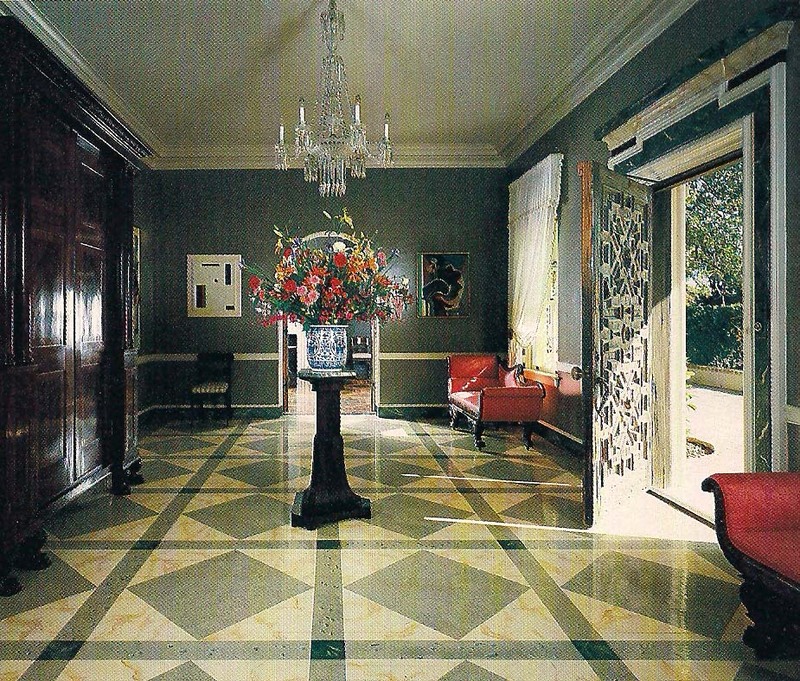 The four acres associated with the residence are developed beyond the three allees planted in 1982 with additional features added by Gervase and later owners. Currently, the surrounding parkland is planted in crops, gone to pasture grazed by a rare breed of cattle, or left as woodland. showing additions and alterations by later owners. The additions behind the screen walls flanking the main block were further expanded and a twin was given to each of the end pavilions. with the added pavilion on the right. A new entrance at the west end opens into an octagonal Hall with a limestone floor and a cupola brings in natural light. A fitted Kitchen is adjacent and equipped with double ovens, a ceramic hob cooktop, plus an integrated refrigerator, dishwasher, and wine cooler. The limestone flooring continues into the expanded Dining Room with marble-topped cupboards. The altered Dining Room of the Menagerie. The photos of the Saloon show more of the exceptional plaster decoration, half of which was missing at the time of Gervase's purchase. 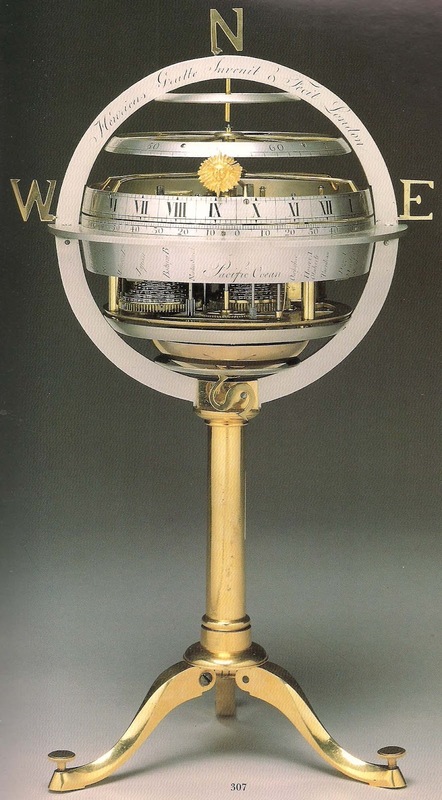 Father Time, in the center of the ceiling, fills his role as center of the cosmos. Carrying a scythe as typical, he is also holding a serpent biting its tail, symbolic of the changing seasons. at the center of the ceiling at the top of the image. Medallions of the signs of the zodiac depicting animals are particularly appropriate for the Menagerie, designed by architect-astronomer Thomas Wright. Garlands of the season link the medallions: tulips for Taurus, may blossoms for Gemini, wheat for Virgo, pears for Libra, and grapes for Scorpio. Summer signs are grouped around the sunburst in the bay, the source of light. Winter signs are grouped around the fireplace, the source of heat. and the recreated plaster urns in the niches. Festoons of musical instruments flank the bay. Above the niches containing urns decorated with animals of four continents, there are coordinating trophies representing those parts of the world. There are ante-rooms, both with doors opening to the south terrace; one is a Study and the other, a Library with shelving and cupboards disguised by book spines. 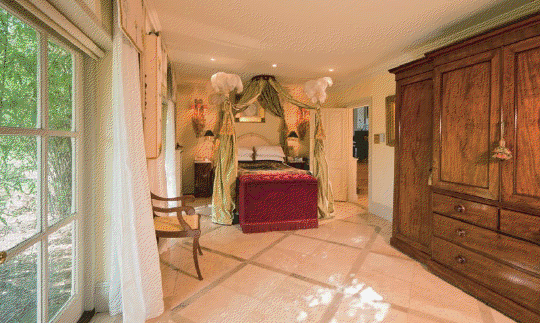 The Master Bedroom, in a space added after Gervase's ownership, has a limestone floor and two pairs of French doors to the south garden. A fitted Dressing Room overlooks the rose garden to the east. The ensuite Bathroom (or Shower Room as it would be called in England), has custom cabinetry, a lavatory (hand basin), toilet (w.c.), bidet, and shower; it is located in a new end pavilion that matches one of the original pair. The Second Bedroom has a view to the north and an ensuite bathroom. This was one of the spaces added by Gervase behind the existing screen wall. occupies the original east pavilion. 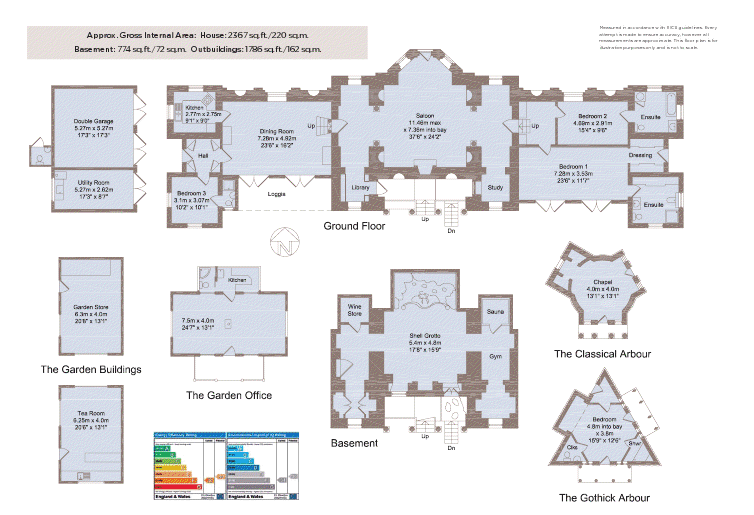 The Third Bedroom (not pictured), adjacent to the entrance, also has a limestone floor and an ensuite Bathroom (Shower Room); it overlooks the south garden. The entrance to the Shell Grotto. 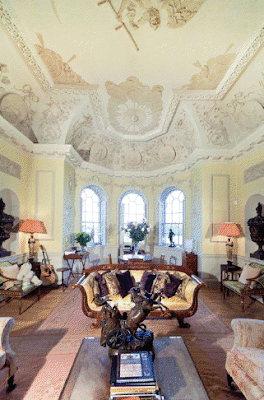 But the most unusual feature added to the historic building is the Shell Grotto completed in the basement in 1995. Christopher Hobbs, who created some of the missing plasterwork in the Saloon, also helped create the fantastic decor. Entered down steps from the garden, stepping stones across water represent the River Styx and guest are met with a figure of Charon at the prow of his boat. Orpheus in the Shell Grotto. 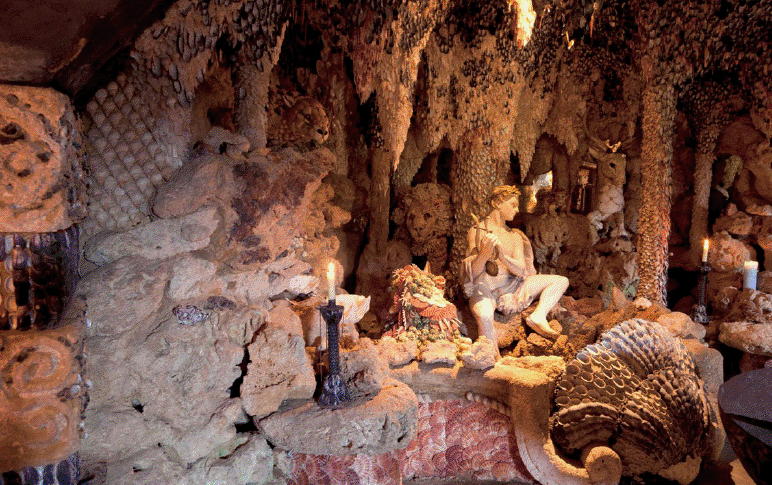 Orpheus plays to animals under a vault of tufa, shells, and minerals. And an open fireplace is guarded by Cerberus, the three-headed dog. This level, which originally contained the kitchen, also has a gym with sauna and shower, and a wine cellar. 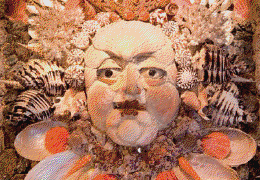 A detail in the Shell Grotto. Except as noted, all images are from the sales brochure produced by Estate Agents Jackson-Stops & Staff. 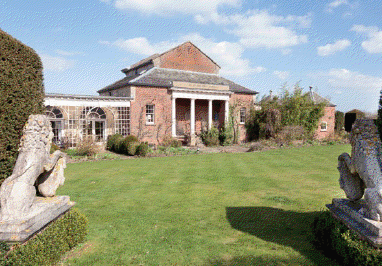 Photos of the garden and auxiliary buildings will follow in Part III, the next posting of The Devoted Classicist. 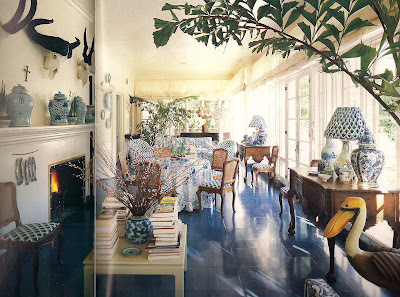 Richard Lowell Neas was a decorative painter and interior designer whose work decorated some of the finest homes of the 1970s and 80s. This project, a house on a five acre estate in San Antonio, Texas, started out as an 1880s ranch house that was remodeled in 1920s. 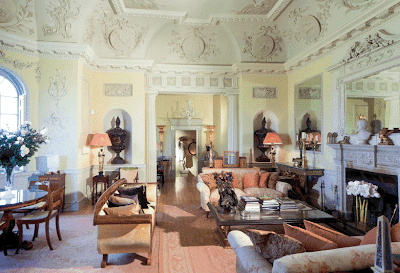 It was home to an art collector who often entertained on a large scale. It was featured in SOUTHERN INTERIORS, edited by Helen C. Griffith, published by Oxmoor House, 1988, the source of all the photos here. 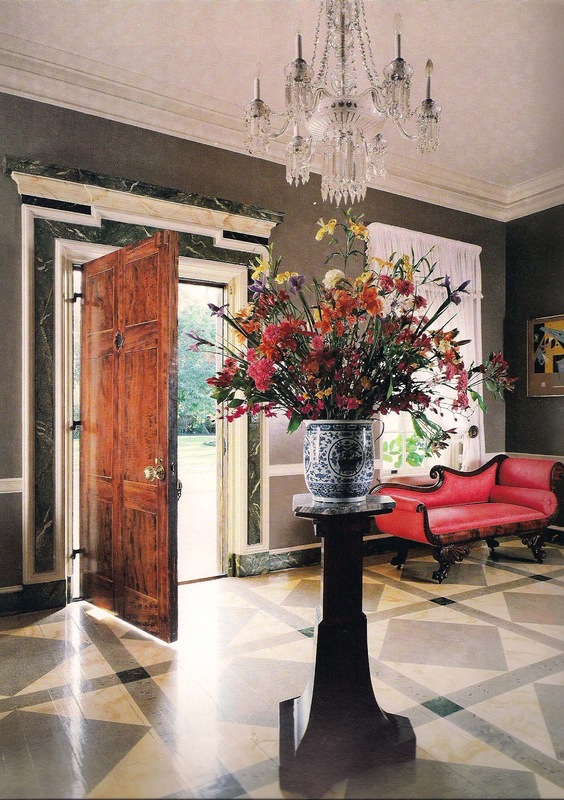 The Entrance Hall features a wood floor and wood trim painted to resemble a combination of marbles. In addition, the inside face of the door is painted to resemble fine wood. 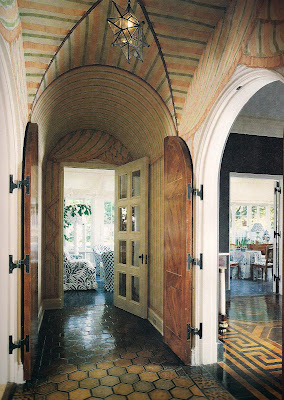 The walls and vaulted ceiling of the Hall are painted to resemble the underside of a fanciful striped tent, gracefully pulled aside at the doorways. Again, the arched doors are painted to resemble fine wood. (Note the olive-knuckle hinges that allow the leaves to lie flat against the walls). The Gallery is seen to the right and the Sun Porch beyond. 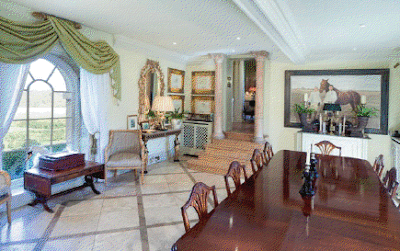 The Gallery is minimally furnished to showcase the owner's collection of art and allow for large gatherings. The finish of the walls is not described in the text, but appears to be a glazed linen effect. The floor is stained to resemble a boldly scaled neoclassical wood parquet. The floor of the Sun Porch is concrete, scored and glazed to appear as tiles. (The blue & white porcelain scheme is a popular motif that appeared in a number of Mr. Neas' projects, including his home in France). 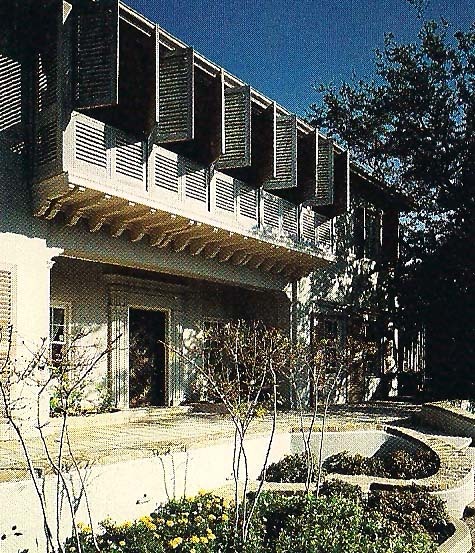 The exterior of the San Antonio project of Richard Neas. Mr. Neas died in 1995 at age 67, but his legacy lives on with wonderful projects, such as this. 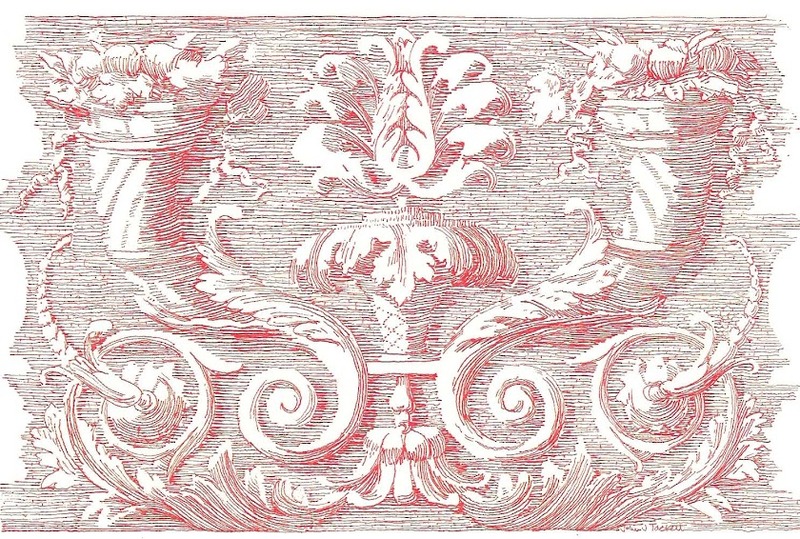 Also he is remembered for the popular trompe l'oeil wallpaper he designed for Brunschwig & Fils "Bibliotheque". 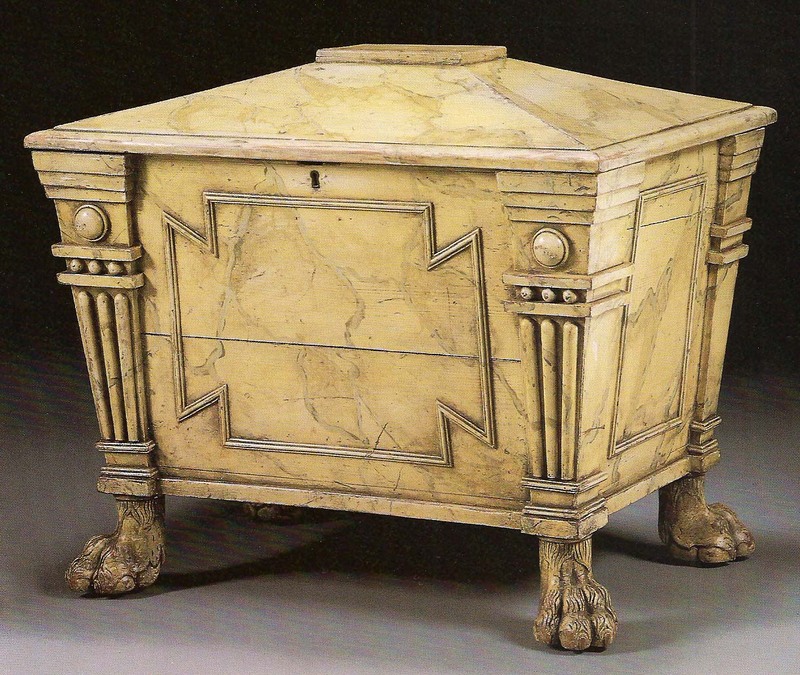 The Devoted Classicist is fortunate to know several talented decorative painters in Memphis, but certainly none more charming than Stephanie Jones whose delightful blog, me & mrs. jones, is featured in the Blog Roll. (This is in the right-hand margin if you are viewing this in the standard format, which I hope you are. Other versions, leave out many features, unfortunately). Stephanie and her husband Epps are the most welcoming and gracious hosts imaginable, and their hospitality really adds to the enjoyment of being a guest in their home. 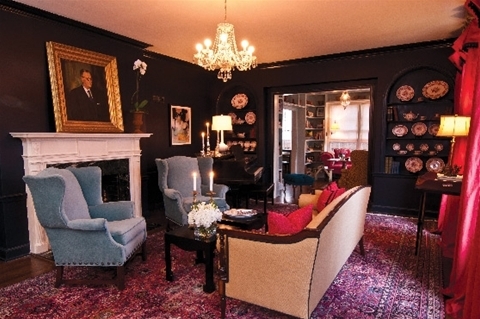 Their Living Room is featured in the current issue of R.S.V.P. Memphis Magazine in the "Room View" article. The two page essay by Kelly Cox with photos by Steve Roberts tells more of the story, so take a look at the link. The drama of the very dark blue walls might be hard to appreciate without experiencing it in person, but it is a success. 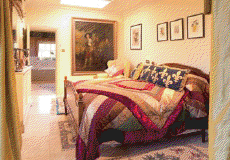 In fact, the whole house is filled with artistic painting, as you might imagine. Not the least appreciated is the little Powder Room whose walls are glazed in a huge Buffalo Check. The Kitchen is a favorite, too; Stephanie is an accomplished cook! Me & Mrs. Jones sells paint and associated supplies in addition to providing instructional classes, so be sure to check out Stephanie's website and her new shop/studio. 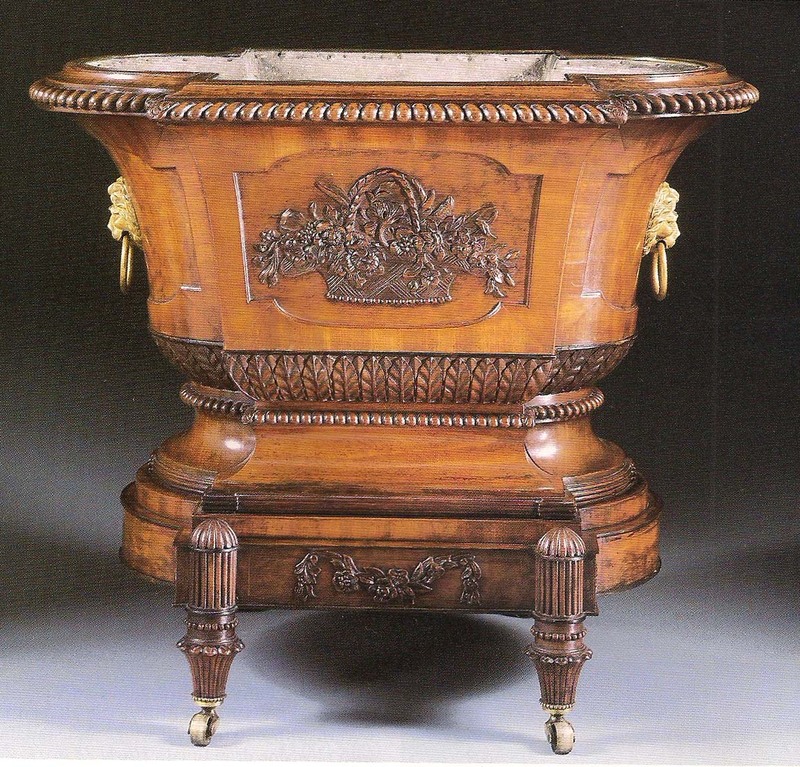 When The Devoted Classicist worked at Parish-Hadley, he came to know the shop of Vernay & Jussel as one of the country's most respected dealers in English antiques. 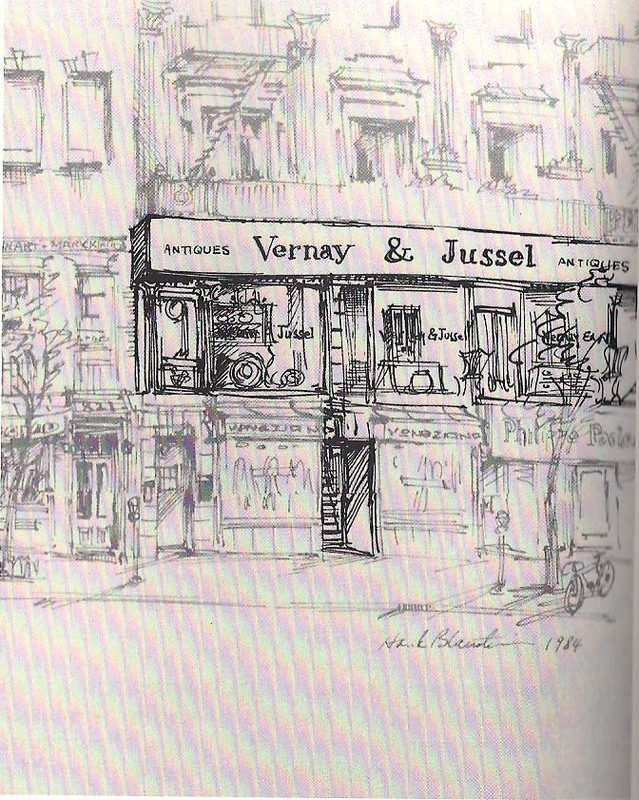 (Parish-Hadley was a customer of the shop, but this writer's reason to visit the Madison Avenue address had to do with business with the owner's brother, Arthur Jussel, an excellent builder who had a small office above the shop). That whole stretch of the avenue is filled with the boutiques of the big names in fashion; I think the Armani men's store occupies that space now. 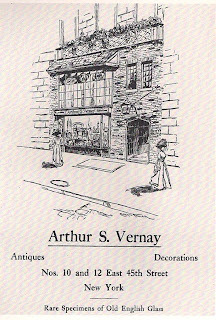 The origins of the business date from 1906 when Arthur S. Vernay established "The Shop Around The Corner" at 1 East 45th Street at the urging of his friend Mrs. Morton F. Plant, a noted collector herself who lived in the magnificent Fifth Avenue mansion that now houses Cartier. 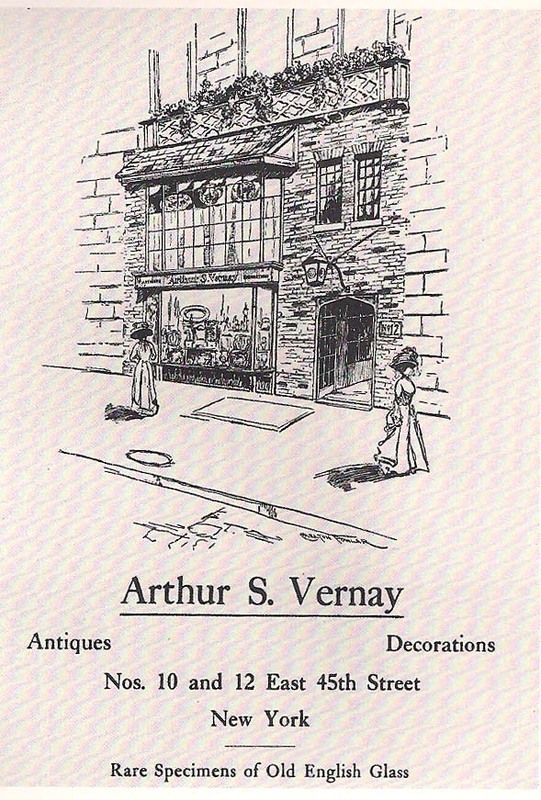 When Mr. Vernay retired in 1940, the firm was bought by Stephen J. Jussel, who had been the firm's General Manager and an employee since 1928. When Stephen retired in 1972, his son Chris became the sole proprietor. 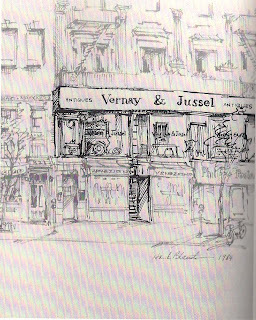 In 1977, the business was renamed Vernay & Jussel. 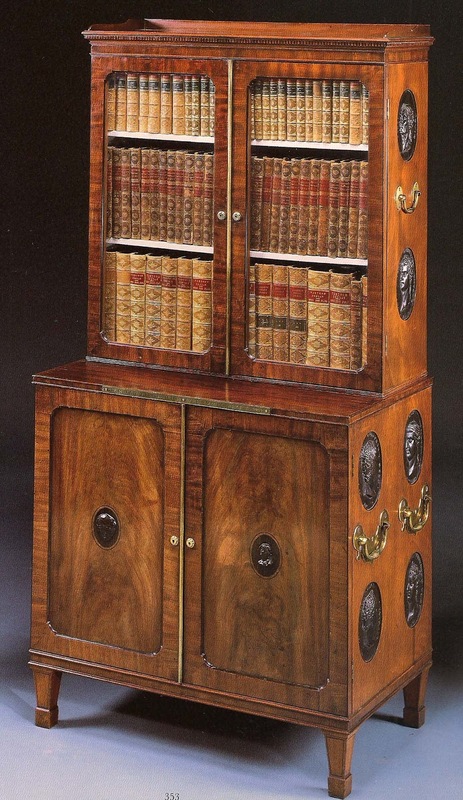 by Thomas Thompion, London, no. 87, circa 1690. The firm consistently provided the highest quality time pieces for collectors and is credited as introducing English clocks into the American market. by Daniel Quare, Ste: Horseman, London, no. 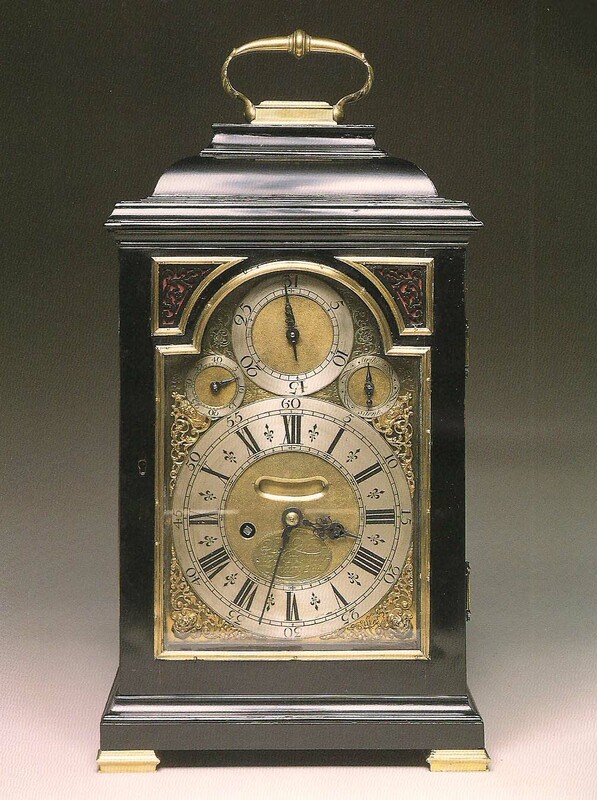 266, possibly dated 1724.
by Henry Gratte, first quarter 19th century. by Allam & Clements, London, circa 1775. 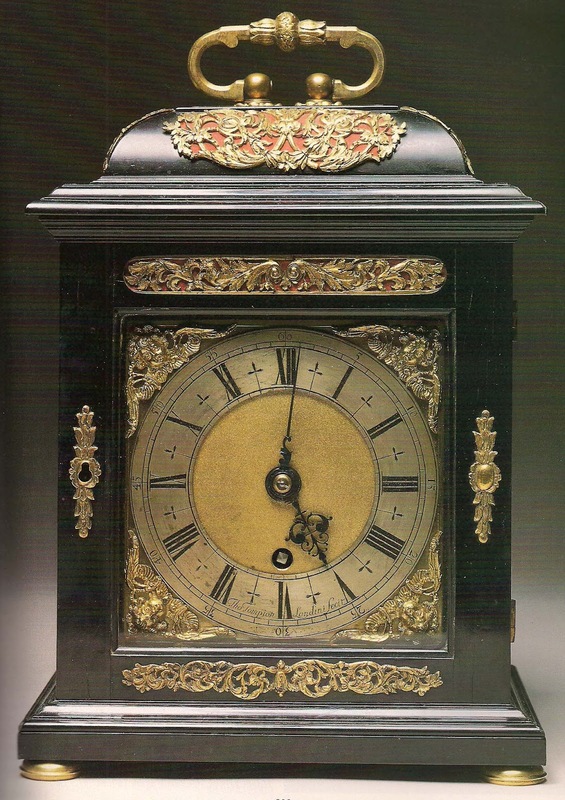 But the shop's inventory varied beyond rare clocks and included fine case furniture, tables, seating, mirrors and rare decorative pieces. in the Province of the West Indies, affiliated to the University of the West Indies). George III mahogany pedestal partners' desk, 1760.
in 1919 and again in 1933). 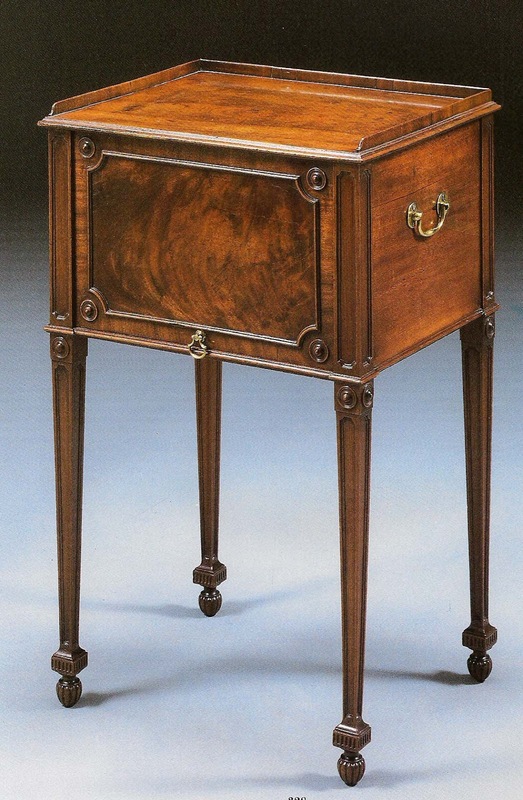 after a design by Charles Heathcote Tatham. By repute, from Castle Howard, Yorkshire. By repute, from Ham House, Surrey. but this was made at the height of the fashionable craze for all things Chinese). 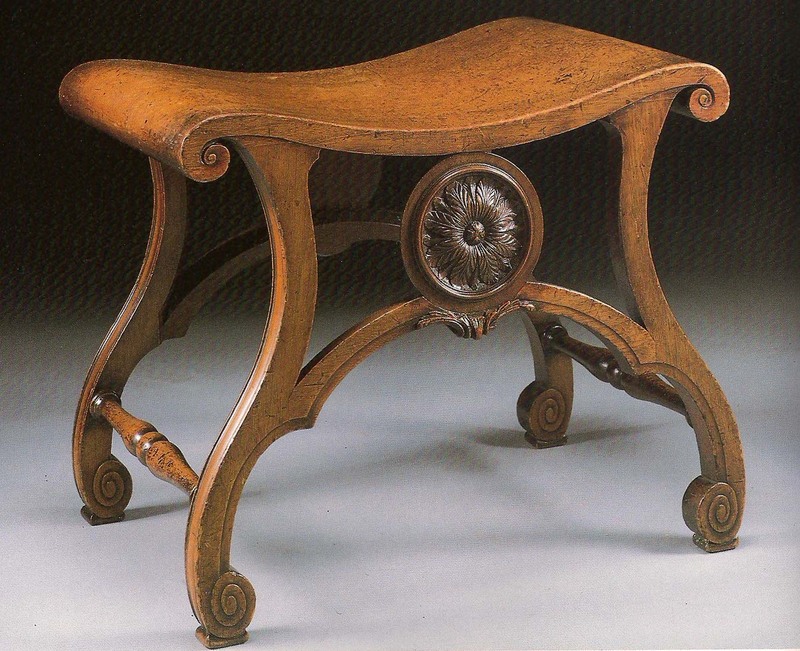 for virtually identical stools supplied by Thomas Chippendale on July 21, 1764). By 1995, real estate demands and a desire for a career change convinced Chris Jussel to close shop and have the inventory sold at auction. One of the highlights of the sale, featured on the catalog cover, was a magnificently carved Neoclassical wine cooler. from the workshop of George Seddon. 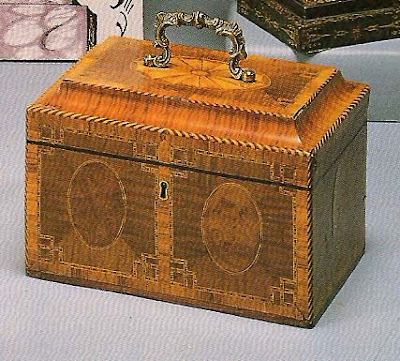 The sale included a wide range of selections, including this fine tea caddy that was given to Stephen Jussel as a birthday present by the Duke and Duchess of Windsor. 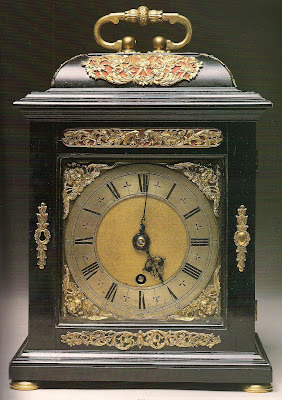 inlaid with various wood, last quarter 18th century. 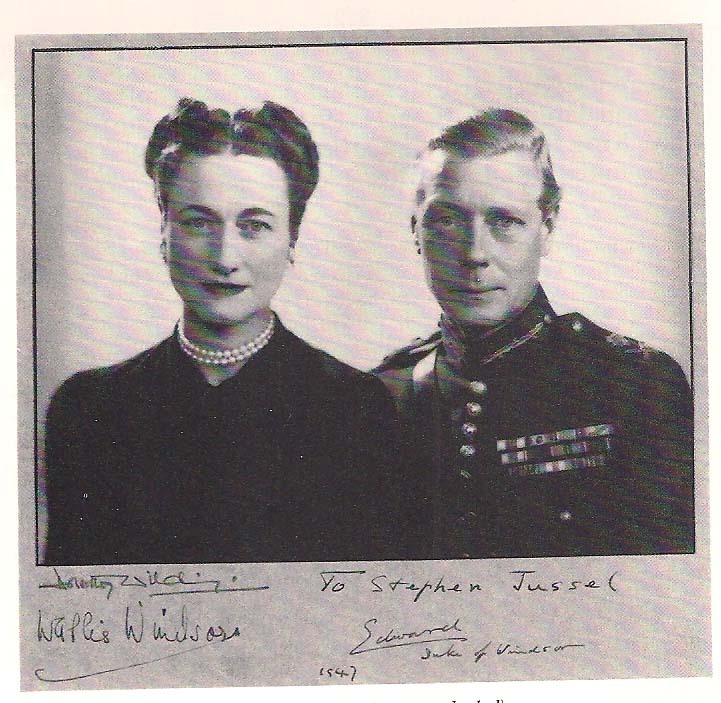 The signed photograph that accompanied the gift. This writer's favorite lot in the sale might have been a fine and rare coin cabinet embellished with 'Grand Tour' souvenir medallions. 17th/18th century, in two parts. 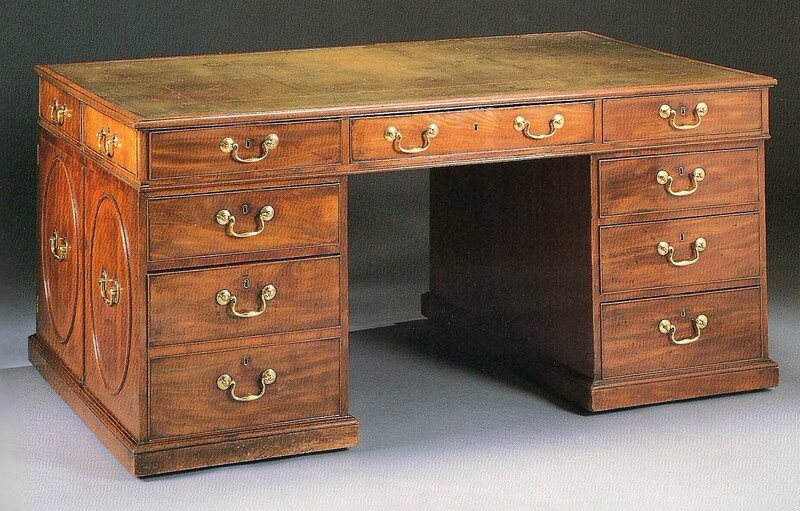 Starting in 1995, Chris was the host of the first four years of the PBS hit television series "Antiques Roadshow". From 1999 to 2003, he was Senior Vice President Sotheby's, Trust and Estates division, and worked on their Online Auctions Program. Chris served as Senior Vice President of Samuel T. Freeman & Co. auctioneers in Philadelphia, Pennsylvania, from 2007 to 2009. 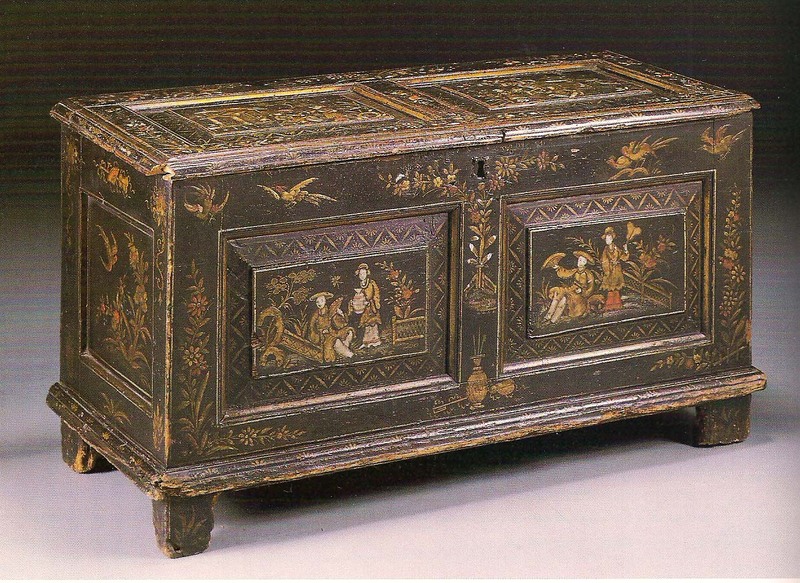 Presently, Chris Jussel serves as a private consultant for art and antiques. The photos, except as noted, come from the Sotheby's auction catalog, "Important English Furniture and Decorations", New York, January 21, 1995, Sale 6658.